Some things you post just because you can. 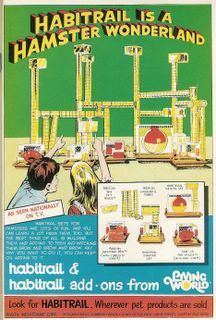 Plus, Habitrails were awesome! They were like Logan's Run for rodents ("There is no Add-On Sleeping Den with Curiosity Cube!"). I remember the children's section of the public library having a particularly excellent set-up. I think that's how my parents tricked me into literacy at a young age. "Hey, let's go see the hamsters. And look, books!" 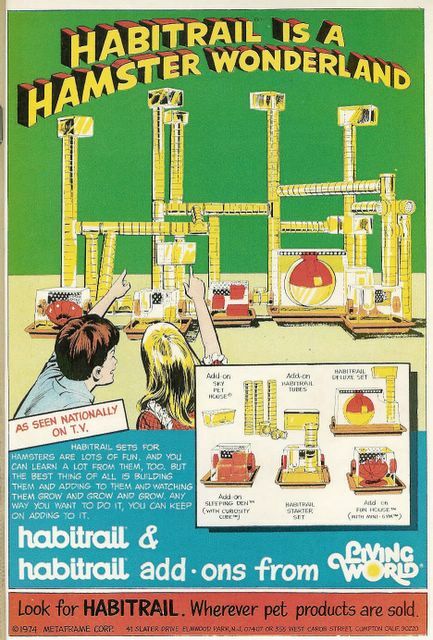 Back before hamsters danced, they ran around in little yellow space stations for our amusement. Life was better then. I've added Snark Free Happy Joy Comic Blog and Dial B for Blog to the roll, as they are both excellent beyond belief. Check 'em out if you haven't yet done so. And while you're checking things out, give a peep to my eBay auctions, and maybe even bid on something. (as I said, I can shill with the best of 'em).